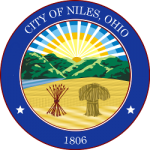 Niles, Ohio is a city whose settlement and expansion is based on the area’s ideal location for the growth of industry. According to the Articles of Confederation, the state of Connecticut was granted the area known as the Western Reserve (everything north of the 41st parallel and 120 miles wide – from the Pennsylvania border to 120 miles west of the border) to divide up and claim. One of the more valuable areas within the Western Reserve was The Salt Springs in the Weathersfield Township area because of the idea of extracting the salt from the water. The conclusion was drawn years later that there was not enough concentration of salt to be a prosperous way of earning a living, and the Springs were no longer used. They were covered over in 1810 when the Baltimore and Ohio Railroad tracks were built. Although Ruben Harmon was the first permanent settler to the area, James Heaton receives the credit for being the founder of Niles. Niles was first known as Heaton’s Furnace, which he later changed to Nilestown in honor of Hezekiah Niles, editor of the Niles Register – a Baltimore newspaper. In 1843, the name was shortened to Niles. James Heaton first found prosperity in the Poland area when he and his brother are credited with having the first blast furnace in the Mahoning Valley. In 1805, they dissolved their partnership, and James moved his family north to the Howland area, and then to the Niles area where he built a sawmill and grist mill at the junction of Mosquito Creek and the Mahoning River (1806). In 1809, Heaton built a forge, producing the first Bar Iron in Ohio. In 1812, Heaton constructed a charcoal blast furnace, naming it “Maria” after his daughter (thought to be the first child born in Niles) to produce iron for his forge. This furnace sat just east of what now is Central Park, on the west side of Mosquito Creek. In 1830, he sold his enterprises to his son’s firm, Heaton and Robbins. James Heaton built his house on the brow of Robbins Ave. It was torn down in 1966. The years between 1840 and 1870 were years of great growth for the Niles area, thanks to James Ward Sr. He is credited with starting Niles on a path of expansion, beginning as a village of 300 people with a single blast furnace, to a town of 3,000 people and a major industrial area and business district, even exceeding Warren in profit by 1870. The people of Niles saw their heavily wooded pioneer settlement grow to a bustling, smoke filled industrial town with numerous mills and businesses, people building houses in the clapboard style rather than log cabin, and railroad replacing that stage coach and canal as the preferred means of transportation. This rapid growth was set off by the discovery of high grade black band ore in Mineral Ridge, therefore making Niles a prime location for the manufacturing of iron from this ore. Unfortunately, the ore deposits were relatively small, and soon ran out. Ward was killed in 1864, but his sons, James II and William took over the business. With the sons at the helm, the business grew rapidly, as various mills were built in the Niles area to encourage the fulfillment of war needs. The expansion, however would later bring about the disaster of the company around the time of the depression of 1873. James Ward and Company failed in 1874, in accordance with the Depression of 1873. Niles suffered much worse for two reasons: 1) the Company owned much of the industry in Niles, and 2)Many of the Niles citizen had invested in the Company, and now held notes that were not worth anything. A brief restructuring was attempted, without much success. Many of the mills, beyond those owned by Ward and Company were bought by outside interests. From 1886 to 1898 the City saw improvements in their industry and economy, marking a time of further expansion. In 1898, Niles saw another recession with many plant closings again. The late 1890s also saw the start of the merger era, as giants such as Carnegie Steel and United States Steel, were on a mission to buy out smaller, less modernized mills. Local people were assured that the city’s mills would be modernized, and would supply adequate competition for the steel giants. Mill owners soon found out that modernization would be too expensive. Many more mills declined and closed up. At the beginning of the 1900s, the iron industry had been greatly overshadowed by steel. The 1900 census showed 7,468 people living in Niles, with a continued in increase for the future. During the first part of the 1900s, other types of industry took over, such as Ohio Galvinizing (1902), Sykes Metal (1903), the Niles Glass Works of the General Electric Company (1910), and the Niles Iron and Steel Roofing Company (1911). The war along with the rise of the automobile industry brought a great influx of new industry and reorganization to the area. The population of Niles rose to just over 13,000 in 1920. First Bridge – On Main Street over the Mahoning River. It was first a covered bridge. Replaced by an iron bridge, then the viaduct in 1933.